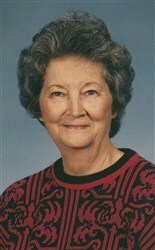 Joy Braziel, 85, of Quanah, died Wednesday, March 7, 2012, in Fort Worth. Services will be at 2 p.m. Monday, March 12, in First Baptist Church of Quanah with the Rev. Joseph Jones, pastor, officiating. Burial will follow in Quanah Memorial Park under the direction of Smith Funeral Home of Quanah. She was born Feb. 9, 1927, in Snyder, Okla., a daughter of the late Roy A. and Audrey (Evans) Croxton. She and Willie Ray Braziel were married on Dec. 21, 1946, in Vernon. He preceded her in death on May 14, 2002. She was a longtime resident of Quanah and a retired teacher’s aide. She was a member of First Baptist Church and the BYKOTA Sunday school class. She was also a member of the Good Sams Club. Survivors include three daughters, Sandra Pritchard of Euless, Peggy Phillips of Mesquite, and Sharon Anders of Vernon; a son, David Braziel of Arlington; seven grandchildren; 34 great-grandchildren; and 11 great-great-grandchildren. Family visitation will be from 7 to 8 p.m. Sunday at the funeral home.